As moms, we always worry about the quality of the store where baby food is bought, and we should do. How often do we hear about recalls and wonder: how long were they being sold before the problem was discovered? Making your own food is not difficult if you have the right tools. 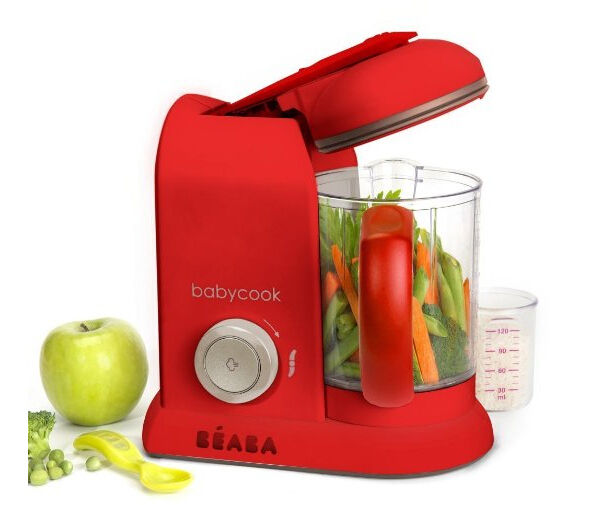 With a baby food maker, you know how fresh the ingredients are, what exactly is in it and have the convenience of doing right at home. Included are several types available with brief reviews. This little gear offers several functions: it chops, purees, warms up the bottles and steams. 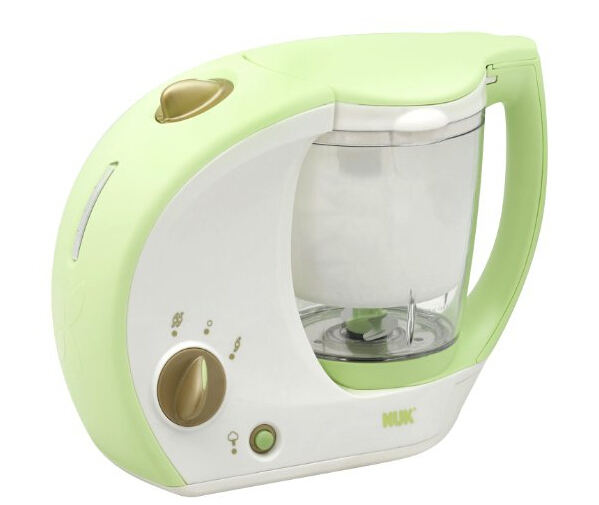 It has a 4-cup sealed bowl capacity, which improves steaming capabilities, and prevents spillage. It also steams evenly which is important for proper food preparation. 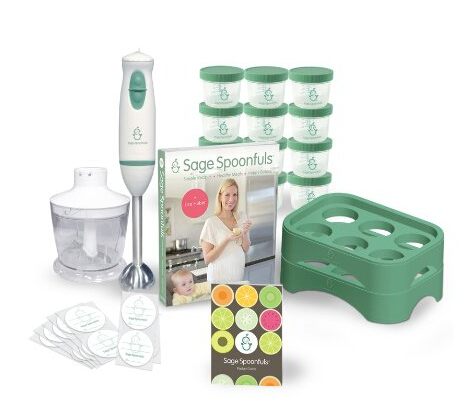 It has a blade lock system and comes with a few goodies like a spatula, measuring cup, bottle rings, a recipe booklet and an 18-month warranty. Price is moderately high, but customers love the bottle-warming feature as it saves them time. This blender comes with a grinding blade and a blending blade. 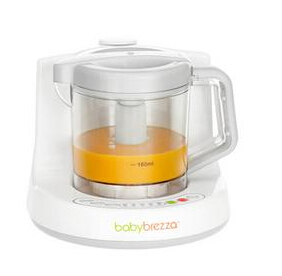 It is perfect for juices as well as making baby food. 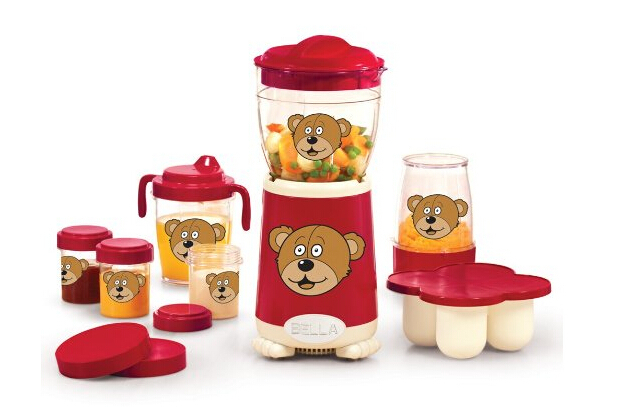 It comes with 4 cups and a blending bowl; all are BPA free and has a 1-year warranty. It has received rave reviews from consumers and the price is very reasonable. Making fresh juice for baby is a gift. And it is easy to clean them. 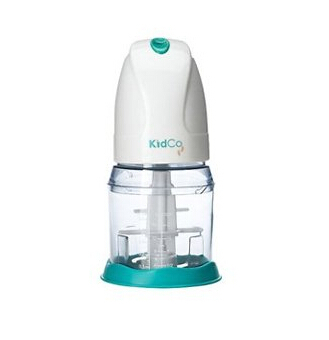 KidCo comes with a 2-cup bowl, a non-skid bottom and a blending attachment for more precise consistency in foods. It comes apart easily for thorough cleaning and everything is dishwasher safe, except for the motor. 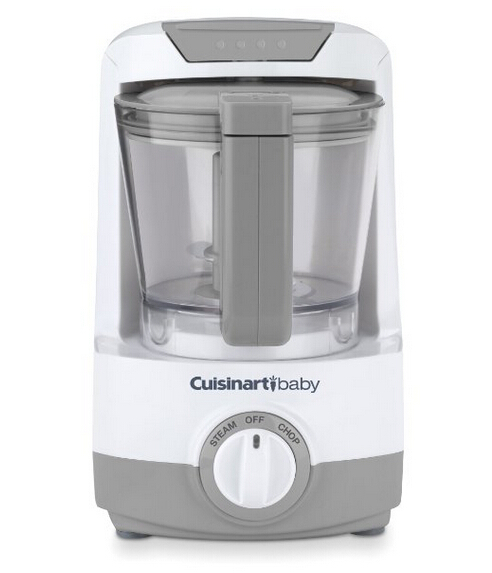 It has a turbo button too, which is great for pulsating control of your puree. Most moms say they love this product. Easy to use and keep clean. The price is very reasonable and it’s cute to boot. Although certain customer regards it as a chopper. It costs a little more than some others but has something to offer. It can prepare raw fruits, vegetables, meat and fish to cooked perfection in 15 minutes. A stainless steel water reservoir is attached for steaming, and it has a large 4.7-cup bowl. There is no lead, BPA or phthalate. The cord is removable for ease in storing it. You can also freeze or refrigerate the left overs and re-heat them in the cook. Included is the spatula, a recipe booklet and a smoothie filter. Most parents’ comments were positive and a few gave negative ones concerning the steamer and the blade. For those who want to start with everything you need to make baby food and store it, look at this. You get a 19-piece storage system with an immersion blender/processor, a recipe book, and storage trays. The price is moderate. The convenience of making and storing with one system is awesome. Although, some customer gave negative comments on the recipe book and the lid. Texture is important to babies, and this product gives you the option of smooth or chunky. It blends and cooks at one time, and has a bowl large enough to make up to 4 meals at a time. It also comes with a double steamer basket to separate foods for maintaining original flavors. Allowing you to progress to chunky foods means it will grow as your little one does. Baby Brezza is automatic. You put the food in, add the water and set the timer…there you go. Now you just wait for the finished product. Blending and steaming happens all at the same time and in one container, so there is less to clean up. Several parents stated the blender stopped working after only a few uses, but they had a quick and courteous response from customer service. 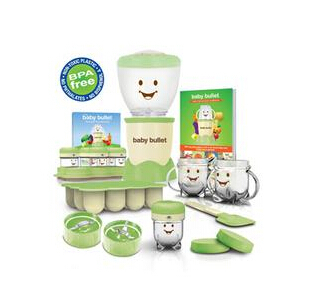 Baby Bullet comes with 2-blades: one for puree and blending and one for cereal making. It is limited to these functions; it does not have any steam function so that must be done separately. It does, however, come with storage containers. It also has a boatload of moving parts, which makes thorough cleaning quite time consuming. 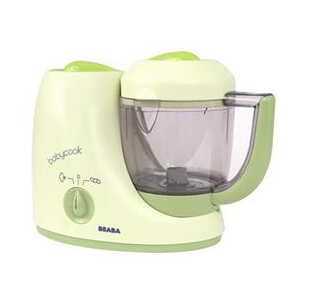 Beaba Babycook is a popular one. 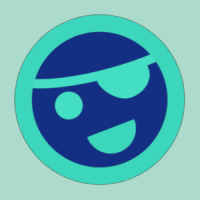 You can do everything with this. It blends, steams, defrosts, cooks and reheats in a very short amount of time. It’s good for fruits, veggies and meat. Moms say it works great and is very efficient. The down side is the small batches of food it makes at one time, and it isn’t the easiest thing to clean. Safety first. The last thing any mom wants to do is give her baby food that can make the little one sick or worse. Pay attention to the safety rules. Use separate knives and cutting boards for meats vs. fruits or vegetables. Wash your hands and maintain cleanliness in foods and cooking food. Follow the manufacturer’s instructions on the food maker you choose. And prepare the machine well before you start cooking. Refrigerate or freeze foods appropriately. Don’t keep left overs for an extended amount of time. A couple of hours at most unless it is frozen. Meats must be cooked properly. You know that babies’ immune systems are not fully developed.